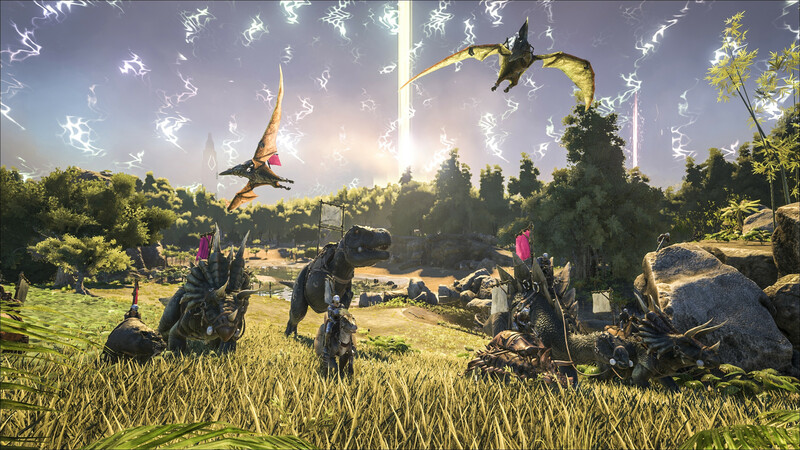 In Ark: Survival of the Fittest players will go head to head with up to one hundred players in a free to play Multiplayer Online Survival Arena, fighting in a brutal last man standing battle players must gather resources, craft tools and weapons, tame wild dinosaurs and kill their opponents before they are killed. The core game is a deathmatch game mode where players are put into a huge arena made up of wilderness littered with native flora and fauna that the combatants will have to harvest and use to craft tools, armor, food, shelter and of course weapons. The core game mode sees players fight in an every man for themselves battle, each time a player in the arena dies the sky lights up and shows a portrait of them to signify another challenger has died. The game is a cross between classic FPS and survival MMOs, players can find different routes to victory that can suit all different types of playstyle. Whilst players can go at it alone they also have the option to play cooperatively in certain game modes and act in Tribes, teams of up to 6 players that can work together to be the last remaining tribe; the game hosts both unofficial and Official ranked servers for players who wish to be competitive in the eSports scene. At the beginning of each game players can make their character, choosing their appearance and name, the identity that they will take in the next Ark battle. Players are also able to create their own tribe for the game that others can join, each tribe member (and tamed creatures) carrying the tribe flag so they can be easily recognised. All characters start at level 1 and will level up throughout the match by building, killing creatures and of course eliminating players, which in turn levels them up and allows them to place points into different attributes such as crafting, health, stamina and more. The island is littered with dinosaurs, from small spitter type dinosaurs that can temporary blind you with their attacks, huge passive herbivores, and deadly “Carno” carnivorous dinosaurs like the T-Rex. Dinosaurs are the primary source of hide materials for making armor, as well as a source of meat to keep your character fed, more importantly they can be tamed to server as your own mount or companion battle pet! Players aren’t only battling against each other; they have to survive the arena itself. Whether being out under the burning hot sun, or caught in freezing waters, combatants will need to create shelter for themselves, campfires to keep warm and cook food. Keeping hunger and thirst at bay is important, having food and water is as much a necessity as bullets. At intermittent times the Arena will fight back, whether the Death Walls closing in, making the arena smaller by closing quadrants off and killing any players in that area, or in game events such as spawning insect swarms or Carno’s on top of players ensuring that there are no safe areas within the arena. Players are able to craft a wide selection of items that they will find necessary for survival, through their crafting menu they can see what resources they will need to collect in order to craft a particular item such as a work station, weapons, ammo and more. At the start of each battle players are dropped into the main arena starting location, naked and without any items, a distance away are dozens of starter packages that players can try and run to and collect first, giving them all manner of tools, weapons, armor and other things they will need to survive. Trying to get an early lead in this way is extremely dangerous, not everyone can get a weapon and those that do are suddenly surrounded by lots of viable targets who can’t defend themselves!